Cannot reach for a wireless telecommunications device or stand-alone electronic device that it no longer requires the driver to be a seated position or properly restrained by a safety belt. The driver can only use a wireless telecommunication device while the bus is in motion as a two-way radio to allow live communications between the driver and school and public safety officials. A driver cannot touch their phone to activate or program a radio app while they are on the road (the road includes being stopped for traffic signals and stop signs). A driver can activate a radio app before getting on the road and listen to the programming. A driver can also listen to programming from their app if it is connected and controlled by the vehicle’s stereo (radio), and the driver is not touching their phone while driving. We caution drivers that music streaming apps that also include video do violate the new law which specifically prohibits drivers from watching videos. 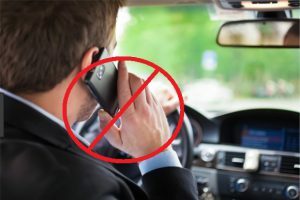 The rule of thumb here is you can listen to your radio app as long as you do not touch your phone when driving on the road AND it’s use does not distract the driver in any manner in the safe operation of their vehicle.